Our private charter cruisers allow you to enjoy the luxury of relaxed boating and all the pleasures of a premium cruiser, without the commitment of ownership. Our charter boats, Moneypenny and Cover Girl are the height of Broads boating luxury. The interiors have been beautifully designed and expertly fitted out by luxury boat manufacturers, Haines, and are professionally maintained by our service team. 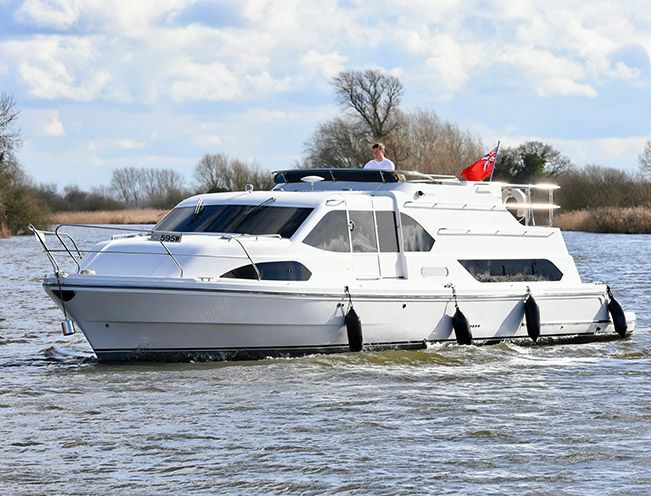 With Moneypenny sleeping up to 6 and Cover Girl a maximum of 4, our cruisers are perfect for small groups to explore the Broads together. New to charter in 2017, Cover Girl is a spacious, open plan cruiser for four, combining exceptional comfort with luxury. Each of the double cabins has ensuite facilities. Cover Girl has a large rear sundeck, ideal for alfresco dining and entertaining. The spacious galley comes equipped with a dishwasher and fridge/freezer, there is ample worktop space and full electric cooking including a halogen hob, oven/grill and microwave. New to charter in 2017, beautiful Moneypenny showcases a modern design that boasts luxury features that provide for a more than comfortable boating adventure. Moneypenny is ideal for entertaining, with a large sundeck for alfresco dining, complete with deck lighting, allowing you to enjoy outdoor socialising long into the evening. Three spacious cabins provide ample space for your party. Explore the Broads from the unique Broadland village of Brundall, a gateway to the Southern Broads. Setting out on the River Yare, you can head upstream and explore the historic city of Norwich, or head downstream and across Breydon Water, into the heart of the Norfolk Broads and beyond, leaving your troubles behind you. Explore the Broads at your own pace, on board our luxury cruisers and create a home from home in the vast Norfolk landscape. The Norfolk Broads has plenty to offer holidaymakers, not least stunning views and a peaceful escape from the pressures of daily life. Waterside pubs, restaurants and cafes, many with moorings available, along with abundant walks and attractions make a Broads boating holiday the perfect getaway for couples, families and friends alike. 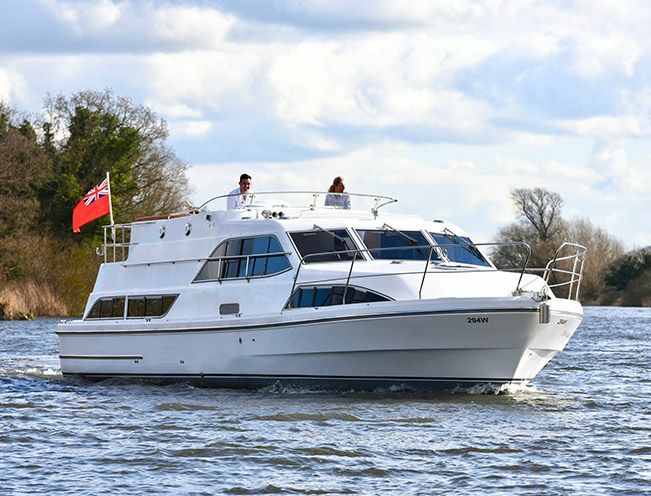 NYA Private Charter was conceived in order to bring a better quality offer to the Broads holiday market. Our boats are not built as ‘hire boats’, they are built to a full private specification and finish and give an unrivalled Broads experience in terms of comfort. Our handover process is detailed and complete and our staff give customers enough time to set off with a good degree of confidence. All our boats have bow & stern thrusters to make handling as easy as it can be. We look forward to welcoming you to the Norfolk Broads.